What most of us do with a problem is we just keep thinking about the problem. We don’t ask our minds to solve it. We just keep talking about the problem. We talk about how the problem “is pretty bad, the problem is a total disappointment, how confused we are, let me tell you about my problem, let me talk to my friends about the problem, let me call my mom about the problem.” Etcetera, etcetera. Does that sound familiar? This wastes so much of our time and mental energy, no wonder it's hard to "get it all done." What if you refused to never get stuck obsessing about a problem again? How much more time and productivity could you create for yourself? I'm not talking about having a completely problem-free life where everything is just rainbows and daisies, and I'm not talking about avoiding things either. No, what I'm talking about is using a totally different tactic in dealing with your problems this year. Instead of thinking about the problem you will think about the solution to your problem. Consider this. What if you solved your problems with the simplest solution? I’ve been doing this so much lately in my personal life and in my business life. And I can’t tell you how much more productive I have been when I am not stewing in a problem, that honestly may not even be worthy of me calling it a problem. I know you know what I am talking about. Remember, that we subconsciously ask ourselves some of the same questions over and over again. Whenever we ask ourselves a question, that is whenever you pose a question to your mind--- it will answer it. So the of the best ways to use this tactic is to learn how to ask yourself quality questions. Or some version of that. Then you want to talk about the problem, even if just in your own mind, and this becomes a bad case of story fondling. Which never helps and just ingrains the problem in your mind by using the same problem-focused thought patterns and brain loops that cause you to lose massive amounts of time and productivity. We only have some many hours in a day, my busyaholics let's not waste them. The question above is a pretty common question my clients will ask themselves, sometimes without even realizing it. But we know minds will always answer when asked a question right? So if you ask it a question like the one above, it’s going to give you a laundry list of all the reasons you have this problem, and all of the things that are supposedly wrong with you. Then you will start to look for, and collect evidence for how this is true in your life. Yikes! This is a dirty little trick the mind plays on us. No wonder we often feel stuck and we can’t find a solution to the problem. Let’s change this pattern this year. The better the questions you ask yourself the better answers your going to get. This means you will think better thoughts, have more desirable feelings, and the better the solutions you will come up with, and the better results you will get! 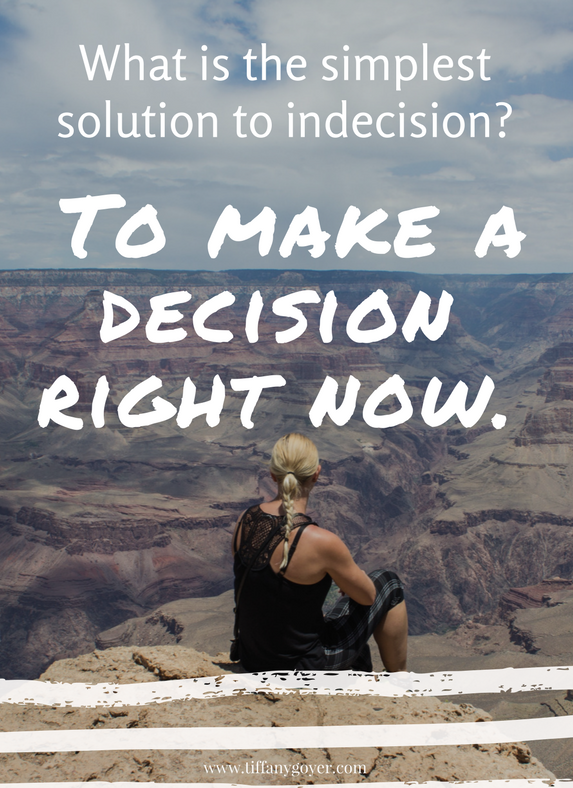 What is the simplest solution to indecision? To make a decision right now. It will solve your problem of indecision, right? Because you no longer have a problem of indecision. You may have a new problem now. You may be a freaked out about the decision you made. But at least you are progressing forward. What is the simplest solution to beating yourself up? Self-love. Do it now. Just decide you are done with self-loathing, and begin immediately to practice self-love. Do it on purpose all day long. 1. Identify a problem that you currently have. 2. Take full responsibility for the problem. Avoid blaming others. Don’t ask others how you should solve the problem because that does not require you to ask yourself and find your own solutions. Honor yourself because you are able to solve your own problems. 4. Watch how your brain will come up with answers. Write down on a piece of paper all of the solutions your mind comes up with. You will be surprised. 5. If no solution comes up, ask yourself, “If I knew what the best solution was, what would might it be?” Don’t tell yourself you don’t know. You always do. 6. Pick the best solution to the problem. Don’t think long and hard about it. Just pick one solution. You can never make a wrong choice. You got this. Change your brain from problem-focused to solution-focused and live this year on purpose. Come join me for my webinar "Making it Happen in 2018! ", and I will show you how to do this now. Older Post6 Questions to Ask Yourself as You Plan to Live on Purpose This Year!